Thanks a lot for your comments and thoughts, guys. Let’s talk about the most interesting questions. Q: The amount of content on that is substantial. I am curious as to how you went about collecting the information for camping sites worldwide. Did you just google, country per country, region per region, city per city? Did you find/buy a DB with the info? Did you do it over a period of time, or grow the content little by little? Thanks, Julien. A: Once again, thank you for your questions, Julien. Well, campingcompass was a lot of work. And this goes for the content as well. We had to manually search and insert enormous information ourselves. However, as the project started to grow and more and more managers started to claim their campsites, the content was growing on its own. People could register, add their campsite and even pay a registration fee for premium packages. On the other hand, managers could pay claim listing fee to be able to manage their campsite. Q: Awesome reading, guys! One question thought.. i’m not skilled with google ads, so, how google know when to pay me? A: Excellent question, Peter. Thanks! First, you need to create your Advertisement account – and everybody else who wants to use Google AdSense, then you can create your first Ad unit. By creating your Ad unit, Google gives you unique code that you put into your website. This code is then tracked by Google and it will automatically generate the ad displayed on your website. So, as you can see, it’s not rocket science. In our first blog, we promised you that we would talk in details about our side project that passively earned us more than $90.000 over the past eight years thanks to a smart monetization through pay per click advertisement. We’ve created a camping website that’s utilizing Google Maps to create a directory of camps all over the world. For more than eight years, campingcompass.com was generating a solid passive income. And even eight years later, our website still has some amount of visitors every month, even though it’s in decline. So what is this Google AdSense we’ve told you about in the previous blogpost? Well, it’s not that hard. AdSense is basically an advertising placement service provided by Google. The program is especially designed for website publishers who want to display targeted text, video or image advertisements on website pages and earn money when website visitors view or click the ads. Having a popular page, AdSense is very effective. More website visitors means more money. 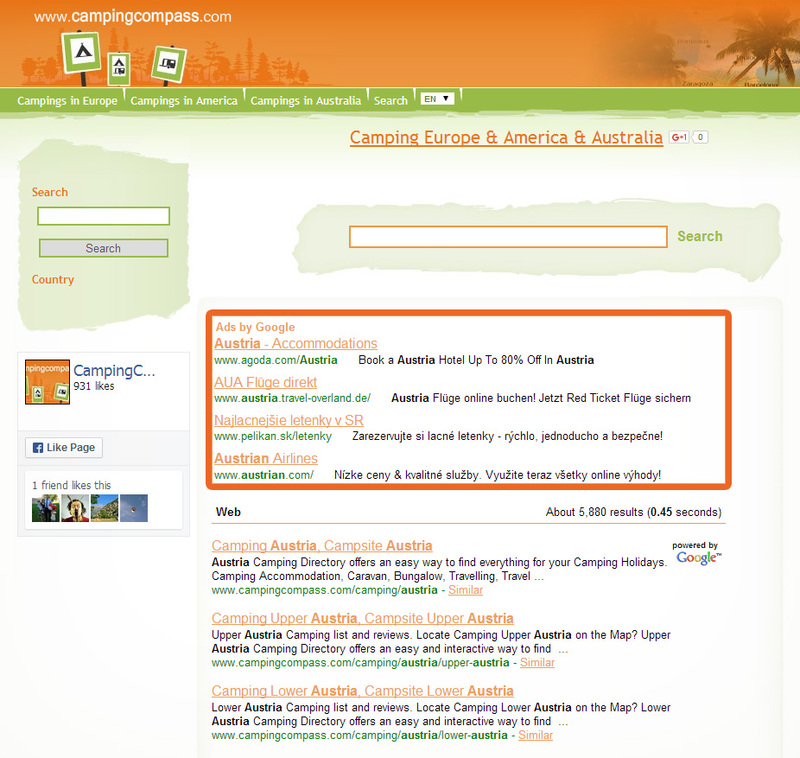 However, pay per click was not the only business model we created for campingcompass.com. We’ve generated enormous amount of content. Basic information about camps, their exact location, sample photos for people to see or contact information for respective managers for every major camp in almost every country. And a camp’s manager was able to claim and further manage their camp’s account on our website by paying a claim listing fee. And many managers have claimed their camp since the beginning. By the way, this is exactly how Foursquare did it few years later. So, with all this talk about AdSense, you might want to check the picture below to see how all the advertisement content on your website should be divided in order to maximize your source of passive income. Red colour means ‘so-called’ hot zone, the best place for your AdSense banner. But that’s not all you can do. After all, you’ve created your website for a certain target group. This is also an important part of setting up your online advertisement: to aim your advertisement model towards that target group. Basically, you have two options: 1) you can point out the ad on your web, so that your target audience can’t miss it (however, this might make the ad more dominant than your actual web content); or 2) you can make the ad lost in-between your content or your web’s design. But what if my target groups is served an ad of my competition? Well, you can simply ban their banners and they’ll never popped out. 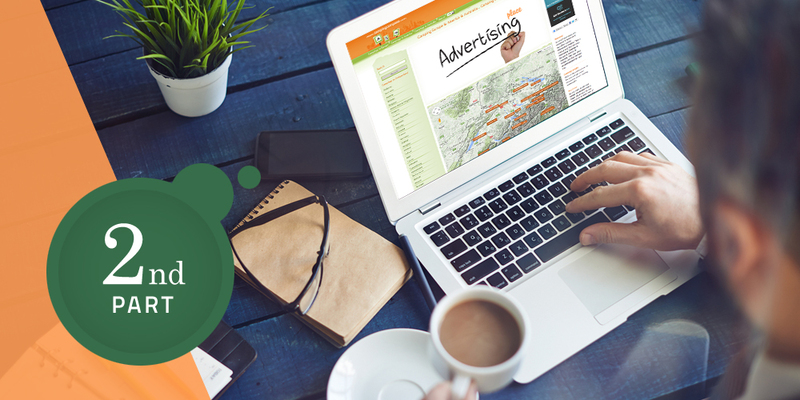 There’re many more advertisement models you can use for your web. Ever heard of Google AdSense for search? It’s a free product that lets you to place a Custom Search Engine on your site to provide users with web search. You’ll also earn revenue from relevant ads on the search results page. Or you can utilize AdSense remarketing to reach your past website visitors or app users. Check out how Google AdSense for search looks like on the picture below. 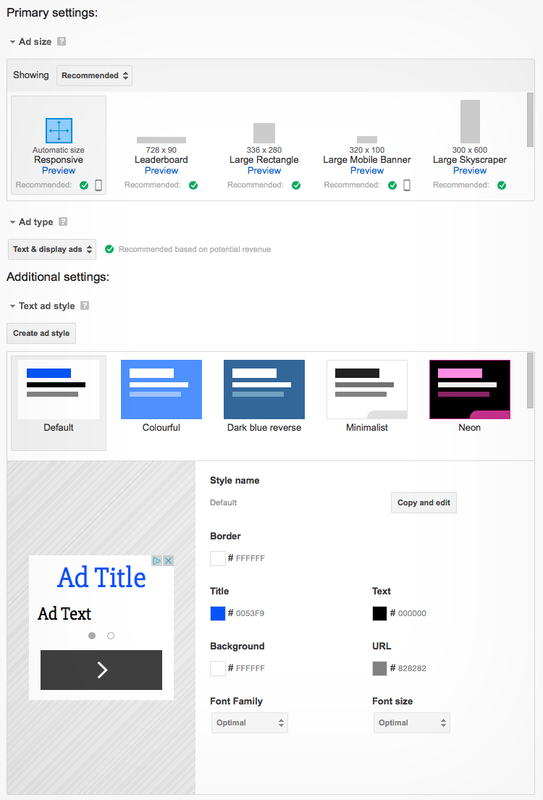 And yes, your AdSense advertisements banners and search pools don’t have to spoil your design. There are many different types of banners you can choose from. Leaderboard banner, Large Mobile Banner, Large Skyscraper or a simple Responsive banner are just few examples. These banners are also customizable up to a certain point: color, font family or font size. You can see some settings on the print-screen below. So, what was the selling point of our website? In many countries all over the world, people were able to search for camps in their country on a single website for the first time. All of this only thanks to our idea to innovate, to distinguish ourselves from the competition, to make campingcompass.com multilingual. However, this was a long process. And in the beginning, it was only in English. Over the years, we defined many new keywords in many languages that are now common in searching for a camp. And we even made some solid money off of it. With a claim listing fee, AdSense banners and custom search engine on a website with great traffic from all over the world, we passively made something over $10.000 per year. In our next blog, we’ll talk about exact numbers and we’ll describe exactly how our side project turned into a business. Don’t forget to let us know your thoughts and questions. We’re always happy to help. this is Peter from Austria. Amazing stuff you’re positing here! Thanks! One quick question though, how much did you earn per one visitor? Well, this depends on few things. It depends on how many ads are on your website, what kind of content is on your website and what ads are displayed. Do you remember our graph from Part 1? We earn something under 10 cents per visitor. thanks a lot for your comment. We definitely agree with you. If your site was so visited, why did you not kept updating it? You maybe can have more money out of it… just my 2 cents. Thanks a lot! Well, we moved to other projects and we’ve kept campingcompass outdated, because it would take us many more hours to keep up with new trends. It was an amazing project, but we moved to the next. This is very inspirational! So, did you make enough money from claim listing fee sales? Or it was just minimal? Thank you for your question! Well, claim listing fee was not too expensive. It had to be priced rationally, otherwise campsites’ managers would not pay us for it. Sitting at something around 9,99 per claim listing was reasonable, so we had quite many sales. It did better then we’ve anticipated. So, it wasn’t minimal at all. I use ads on my web, but I never heard of Custom Search Engine… is it worth it? Hello! And tell me how you translated the website into other languages? independently or translators online? Good question, website was translated into other languages using online services. There are no so many texts though, it’s mostly about localized location names and right keywords. Good job and good templates guys! We’ve a similar project in Italy, not only for camping! That’s great. Feel free to share more details about your income streams here if you like. Creating a website with a lot of traffic is the cause of death for most internet projects. An original idea is not enough to bring the traffic. As you said, this project has been running already for eight years and you put hundreds of hours into it. Last but not least: you have to pay for advertisement. The good texts, the original idea is not enough. You need to advertise your site in google, in Social Networks, grow your visitor’s basis to make them comeback. I am sure that in eight years you have invested much more than 90k. But still, you need to keep working in your site, adding value to it. Which means reinvest your 90k. Great comment. I definitely agree with you, your website needs to get significant traffic in order to monetize it. I need to mention that we have never run any ads to promote our website. The thing was that the content and niche of the website was so unique, nobody else was doing that. Google maps were just starting at that time and it was completely new thing for visitors. Also as we didn’t need to pay a 3rd party developer to do the programming, it was not that expensive to develop it either. After all it was a successful project. It was generating revenue for us (and still is) but most importantly we learned a lot of new things while running this portal. Even if you do not need to invest (money) because you are programmer, the value still exist. And that counts. Getting traffic without advertisement might have worked eight years ago. Today all looks a little different. By the way, you still need to create content, look for new places that might be new open, and add it to the project and keep its value growing. Otherwise your site will die and sooner or later, other websites will take your number one place. That’s right. Good news is, that today you don’t need to invest that much time and money into developer as there are ready to use WordPress themes you can use for your online business. This continues to be a very interesting case study. 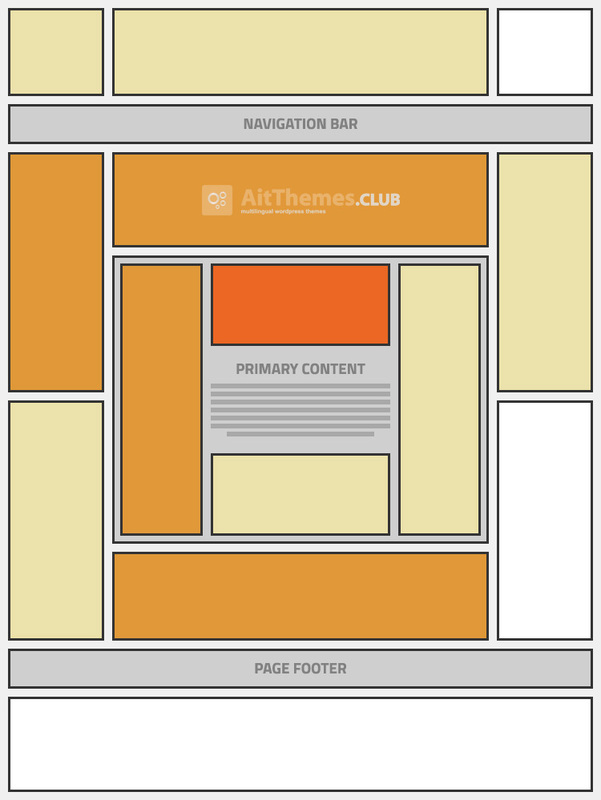 – which of your themes would be best suited for a similar project nowadays. – to get back to the content: over time, how did you manage updating content: mostly, camping sites that closed, or changed. Regular automated emails? – can you suggest any project management software or method that can help step by step development of this kind of project? Thanks for your message. At the time we were developing our campingcompass.com there were no options like ready to use directory WordPress themes. We had to invent and develop all the features ourselves. Based on our real life experience we’ve developed our first Directory theme few years ago and thanks to continuous use and customer suggestion we have created new City Guide theme and Directory+ themes. I’m happy to say that we’re very close to launch a brand new theme, but we will talk about that in more details in the 3rd part of this case study. Back to your original question about content. As I already mentioned we’ve inserted lot of information about campsites into our portal manually. Contacted camp sites to claim their listings and portal started to grow without our interaction. Users were registering and maintaining their records online. Regarding project management software, we’re using Redmine for several years now. I think it’s worth having a look at. Thanks guys! Thanks a lot for examples and for this study! You’re very welcome Michael. Make sure you don’t miss the 3rd part of our case study! mam zaujem o vase temy, no mam obavy ci to zvladnem sam spojazdnit. mozte doporucit niekoho (osobu ci firmu) ktora s vasimi temami robi..tj. upravuje ich pre koncových klientov pripadne neskor poskytuje pomoc s aktualizovanim? idealne ak to budu slovaci, vdaka vopred. ďakujeme za prejavený záujem o naše produkty. Prakticky nemáma priamy kontakt na niekoho, kto by sa zameriaval na finalizáciu webky, avšak vždy doporučujeme napr fiverr.com.